159 kilometers separate these two northern capital cities. Flanders hub Antwerp's metro area encompasses some 1.2 million people; the canal-laced Dutch capitol hosts more than two million. How many of these are Roma (Gypsies)? I don't know. But they must form a significant proportion of the artistic communities, if two recent albums are any indication. First, to the Netherlands. where the Amsterdam Klezmer Band are holding forth with a blend of klezmer and Balkan tunes. The band started in 1996 when some lads from Jewish backgrounds started busking, and it evolved into a leading purveyor of, as they describe it, "sirba, turbo-polka and booty-shaking cocek, oompah, and motley rhythms." 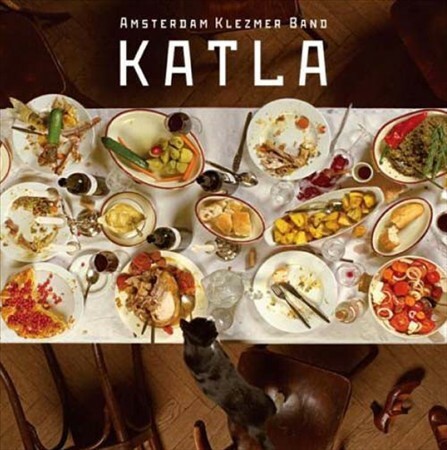 Their ninth album Katla (named for the largest volcano in Iceland) is full of such sounds. Not as destructive or unpredictable as a volcano, perhaps, but energetically blending strings and horns, voices and instruments in a danceable blast that, to my ears, leans far more toward Balkan styles than klezmer. Not that I'm complaining. Be sure to check out the unusual "Desert Banjo" and the manic "Geen Sores." While the Amsterdam Klezmer Band certainly doesn't hew strictly to traditional forms, they seem downright sedate compared to their Belgian neighbors the Antwerp Gipsy-Ska Orkestra. 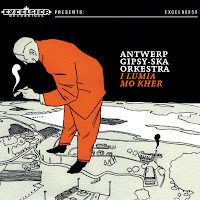 The new album I Lumia Mo Kher starts with the self-referential "Basalaja," which declares the "Antwerp Gypsies in the house" accompanied by the rapidfire trumpet of Marko Markovic. There's a Balkan-ska party bursting from the digipak that houses this CD, whose title translates as "The World Is My House," and it's infectious. So don't blame me if you find your neighbors dancing in your back yard shortly after you crank up "Kerta Mange" or "Kitzenzoi." The verdict? If you're a fan of club beats and brash showmanship (think Shantel), go with the Belgians (though I've yet to find it for sale in the usual outlets). For music that's just as danceable though in a slightly more acoustic vibe, the Dutch will do. But why choose? They're both stellar albums that will keep your ears and dancing shoes happy. Nick -- I haven't heard She'Koyokh's latest -- will have to dig that up. Thanks for the recommendation!